It seems like everybody is starting a newsletter these days. (Guilty.) But there’s a good reason for that, of course. With so much news consumption coming through algorithmically based platforms such as Google and Facebook, newsletters are one of the few remaining ways to have an unmediated relationship with your readers. Newsletters are also one of the most effective ways of building a habit with readers and then converting them into paying subscribers. That’s why The Seattle Times has spent a lot of time and energy over the past year or so refining its newsletter products. 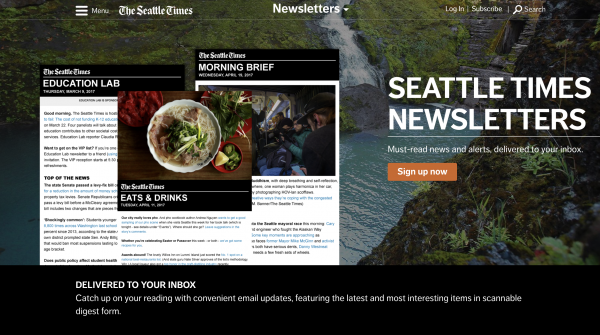 This week in Solution Set we’re going to learn more about The Seattle Times’ approach to email newsletters. Solution Set is a new weekly report from The Lenfest Institute for Journalism and the Solutions Journalism Network. Every Thursday, we take an in-depth look at one nifty thing in journalism, share some lessons you can take away, and point you toward other excellent resources. 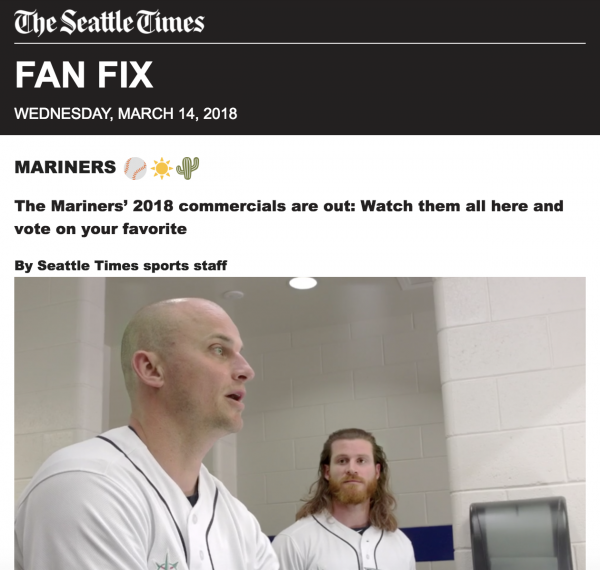 • The Challenge: The Seattle Times needed to craft its newsletter strategy to meet its overall organizational goal of converting digital subscribers. • The Strategy: The Times has developed link-heavy newsletters that encourage readers to click through its website, hit the meter, and ultimately subscribe. • The Numbers: Times readers who are referred by an email newsletter are 25 times more likely to subscribe than a visitor who is referred from Facebook. • The Lessons: Put reader needs first when you’re designing a newsletter and also don’t be afraid to kill something that isn’t working. 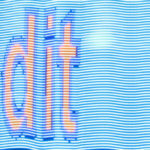 • The Future: Short-term: The Times wants to make it easier to automate some of its emails. Long-term: The Times wants to add more personalization features. • Want to know more? : Scroll down for some guides about starting and maintaining your own newsletters. There are links for beginners and experts. In August 2017, Seattle Times staffers gathered for a celebration of life ceremony to honor the life of a dearly departed friend. People shared fond memories and reminisced about happier times. The Times was saying goodbye to the Weekender newsletter, one of the paper’s first weekly email products that it launched in 2016. Sent out every Thursday, the Weekender, as its name suggests, highlighted cool things going on in Seattle each weekend. That year, the Times realized that dining coverage in its daily Morning Brief newsletter was very popular. As a result, it decided to launch a weekly Eats & Drinks newsletter. That was eating some of The Weekender’s audience. Throughout 2017 though, the audience and revenue coming from the newsletter steadily declined. “After a few months, we said this doesn’t make sense to continue,” Kristi Waite, the Times product manager who oversees email told me. 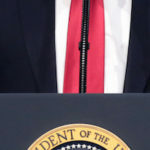 “We have this great content. We brought it out in a way that makes sense for what it is and for the people that want to get it, it was a natural next step,” she said. So it was time to say goodbye. The Times held the celebration of life to recognize all the hard work that went into the Weekender and also to acknowledge that its legacy and influence would live on. “At the time, someone could have looked at that like, ‘Oh, I’m really upset. That’s something I cared about, and the company doesn’t want to do it anymore.’ But now that we’re eight months out from that, you can see that that’s freed up time for the creation of a different newsletter and experimenting with that,” Times Vice President of Innovation, Product & Development Sharon Chan told me. Even as the Times said goodbye to The Weekender, it had spent most of 2017 advancing its newsletter strategy so it would better align with its overall goal: Driving subscriptions. The Seattle Times introduced a metered paywall in March 2013, and since then direct reader revenue has only grown in importance for the paper. Newspapers all over the world have turned to subscriptions and direct reader revenue to try and counteract plummeting print advertising revenue and the continued dominance of Facebook and Google in the digital advertising market. And with an increasing amount of news consumption occurring on mobile devices through social platforms such as Facebook, publishers have been looking for ways to directly reach readers without having to deal with the platforms’ algorithmic whims. None of this is particularly surprising, of course, but these realities explain why the Times fixated so much energy last year to advance its newsletter products. It saw them as a way to build reader loyalty — and to convert those readers to subscribers — while also providing an engaging product for potential advertisers and sponsors. As a result, the Times has been experimenting with different factors such as subject matter, frequency, length, and more to improve the newsletters’ performance. Here’s an example of how the paper’s approach has evolved. In Fall 2016, the Times launched a weekly Seahawks Fan Fix newsletter covering the city’s NFL team. The first iteration of the newsletter essentially featured a story written in the body of the email. For the 2017 season, it expanded the newsletter to cover the University of Washington Huskies and rebranded it as Football Fix. Using its analytics tools, the Times knew that the propensity to subscribe based on UW coverage was higher than normal, which is why it expanded the focus. The paper also changed the format to be more of a digest that featured many more links back to the Times’ site. The goal with this was to get readers to hit the site’s meter so they would ultimately subscribe. 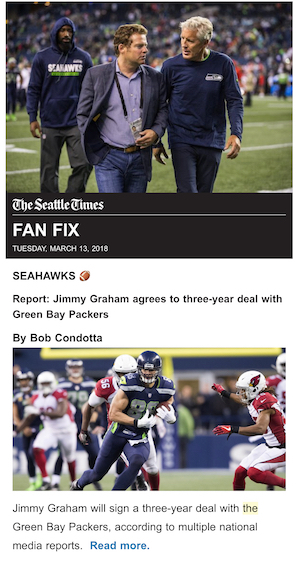 Based on that success, the Times this year expanded the Fan Fix newsletter to cover all of Seattle Sports. The first issue of the redefined newsletter was published Jan. 2, 2018. The Times has taken similar analytics-driven approaches to other newsletter expansions. Earlier this month, based on the growth of its morning news digest email, it launched the evening news email, which Chan mentioned. And last year it debuted its weekly Eats & Drinks newsletter, which hastened the demise of The Weekender. That constant iteration has also occurred on the advertising side. Borrowing a page from newsletters such as Politico’s Playbook, the Times created text-only ads to drop into its newsletters. It thought they felt more natural to the format than banner ads, and Waite said they fetch higher CPMs than traditional banner ads. Having Waite work as a cross-functional product manager thinking about all aspects of the paper’s newsletters has allowed the Times to grow more strategically. “It’s really important for The Seattle Times strategy to have a product manager outside the newsroom thinking about it and working cross-functionally with marketing, circulation, advertising, and news,” Chan said. The Seattle Times currently publishes six newsletters. The paper aims for at least a 30 percent open rate and a 7 percent click-through rate for all of its newsletters. Not all of the newsletters — particularly the weekly ones — hit that rate, but “we certainly hold our daily/M-F emails to that standard,” Waite told me in an email. Seattle Times website visitors who are referred by an email newsletter are 25 times more likely to subscribe than a visitor who accesses the site from Facebook. And in order to get readers to hit the meter, the Times tries to include at least 20 links back to the website in each issue of the Morning Brief and at least 15 links in other newsletters. Frequency also improves conversion rates. The Times publishes its Morning Brief, Evening Brief, and Fan Fix five days a week, Monday through Friday. It’d like to add more frequent newsletters to build habits among readers and, again, get them to ultimately subscribe. • Meet reader needs: This is a simple, but important one. Readers should dictate your design choices. The Times now has morning and evening briefing newsletters, but each looks radically different. The morning newsletter is text-heavy and is a more narrative walk through the news. The evening newsletter, meanwhile, features big bold photos and short captions summarizing each story. The emails were designed to have distinct looks because the evening newsletter is partially automated but also because readers are consuming the email differently in the morning versus the evening. 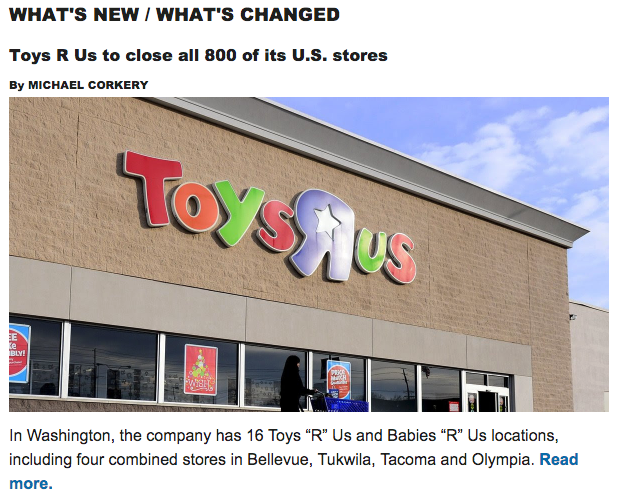 Here’s how the Times covered the recent news that Toys R Us is closing its U.S. stores. For instance, the Times determined when it would send the Evening Brief based on when most people were accessing its site during the nighttime hours. It also designed the email to primarily function on mobile, since that’s where most of its readers are accessing it. • Make it easy for people to sign up: As part of its emphasis on newsletters, the Times last year created a unified newsletter landing page and also created standalone sign-up pages for each of its newsletters. It has also made sure to emphasize email sign-ups on its homepage and, most importantly, article pages. For most websites — the Times included — a ton of visitors arrive directly on article pages, coming from Facebook, Google, or elsewhere. As a result, you should prominently ask for email signups within article pages. Waite can control what email newsletter signup promotions readers see depending on what section they’re reading. So, for instance, if you’re reading a story about the Seattle Sounders soccer team, you’ll see a promotion for the Fan Fix newsletter. Waite will also work with the paper’s circulation and marketing departments to identify reader segments that might be interested in newsletters and undertake campaigns to attract subscribers. • Time is money: It takes 90 hours a month to produce the daily morning email. That’s a lot! Waite works with staffers in the newsroom to calculate how long they work on each newsletter to determine whether it’s worth the investment of their time and resources. Like most newspapers, the Times has limited resources — it currently has about 145 people in the newsroom, down from 375 in the mid-1990s. To try and maximize resources, the Times has worked to automate some of its emails. 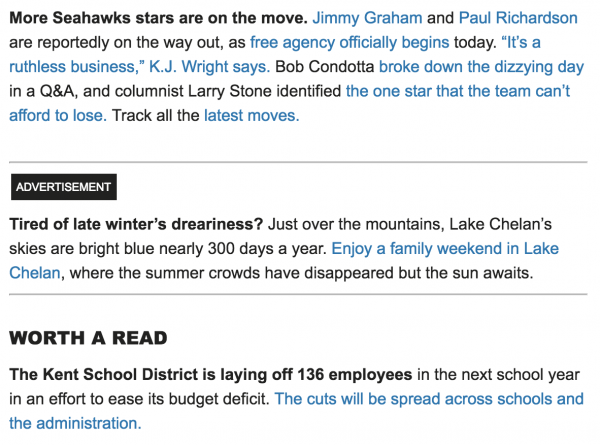 Staffers can pick the stories they want to include in a newsletter within the Times’ WordPress-based CMS. Those stories are then pulled into the email platform along with headlines, story summaries, photos, and captions. Staffers can make tweaks to make sure things look okay, and they can also write a blurb at the top to introduce the newsletter. The Times first attempted this style of curation with Fan Fix, and now is using it with the newly created Evening Briefing. During football season, the Times sent the Football Fix email out seven days a week — four of those days were curated, and three were automated. In fact, she said, the clickthrough rate on automated emails was higher by more than a percent. As it thinks about adding future newsletters, Waite and the Times are looking at other areas they can automate in sensible ways that don’t detract from the reader experience. • Don’t be afraid to kill things: We touched on this with our discussion of the Weekender way up top, but the lesson from the Times’ experience with that newsletter is clear: Don’t just keep doing things because that’s the way you’ve always done them. If something’s not working, stop doing it. Then apply the lessons you’ve learned to something new. Rinse and repeat. With the Weekender, much of the popular dining coverage that was previously in the newsletter was in the new stand-alone Eats & Drinks newsletter and the Times’ daily newsletter. The Times’ immediate next goal with newsletters is to continue to make the automation process run more smoothly. It wants to make it as easy as possible for staffers to take stories from the CMS and move them into the newsletter platform. Longer term, its goals are to figure out where it makes sense for it to create additional newsletters and also how to further optimize its current lineup. For the remainder of 2018, the paper is going to focus on improving its A/B testing and also looking for ways to personalize newsletters. Here’s how personalization might work. Say you’re a subscriber to the Morning Brief newsletter, but you live in Mount Vernon, Wash., a Seattle exurb about 60 miles north of the city. If the Times knew that’s where you lived, it’d be able to give you the weather forecast for Mount Vernon, not Seattle, in your briefing. If you’re a paying subscriber, the Times could also send you messages about your account and whether it was due for renewal. “We’re trying to make it feel as much as someone as coming to your door and handing you a newsletter as possible,” Waite said. • The newsletter startup Revue put on a session in London last week that went over some of the basics of newsletter strategy. If you’re just starting out, check out the slides from that talk to get a sense of some of the basics and what you should be thinking about. • Another Seattle-based news org, Crosscut, last year created a tool that will give you advice for what type of newsletter you should start based on your goals and overall ambitions. This is another good resource for people thinking about starting their own newsletters. • ONA’s New York chapter held a series of talks about newsletters last month. Here are the slides from those events, which touch on everything from strategies short-term pop-up newsletters to the best way to get people to sign up for your newsletter. • And for something a little more advanced, you should check out this Shorenstein Center report written by consultant Jacque Boltik about how to better analyze newsletter data. • Finally, for more on newsletters, check out Better News, a new resource from the American Press Institute that’s part of the Knight-Lenfest Newsroom Initiative. Newsletters are a topic I’m hoping to write more about. Is your newsroom doing anything cool in people’s inboxes? Let me know! I’d love to talk to you about it.Send me an email, I’m at [email protected]. Photo credit: Creative Commons Seattle skyline photo by Jon.